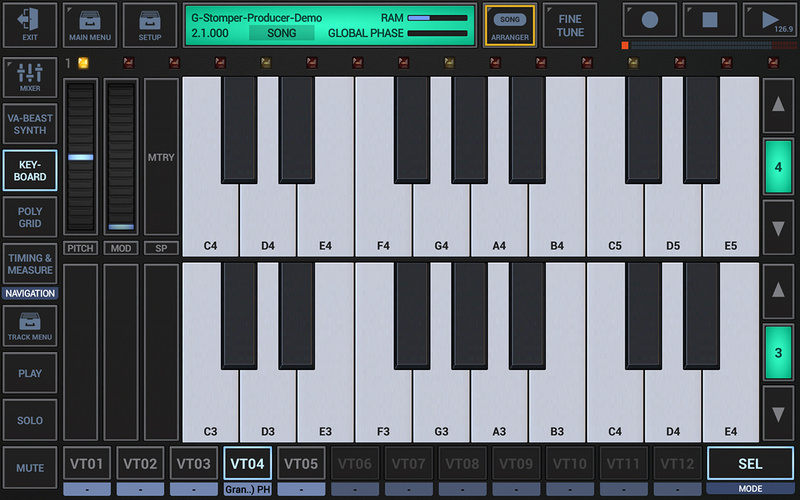 G-Stomper Producer by Planet-h.com is a Mobile Audio App. 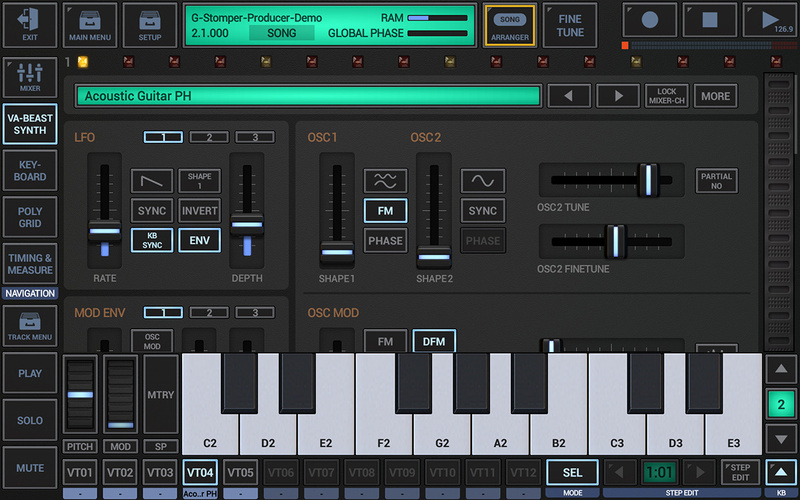 G-Stomper Producer is a fast and flexible Music Sequencer and Digital Audio Workstation, designed for use in live performance as well as for production. 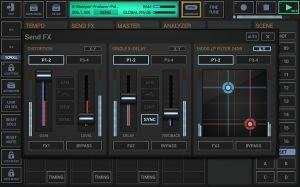 It comes with a powerful Drum Sampler, a polyphonic and multi-timbral Virtual Analog Performance Synthesizer (VA-Beast), Sounds, Effects, Sequencers, Pads and Keyboards, a graphical Multi-Track Song Arranger, and many other creative features that help you to create your own music. Jam live, improvise and let the music happen spontaneously, play patterns of different lengths/quantizations, simultaneously and in any combination, without having to stop the sequencer at any time, and finally write your creation down as a Song. Sample based Drum Machine, max 24 Tracks. 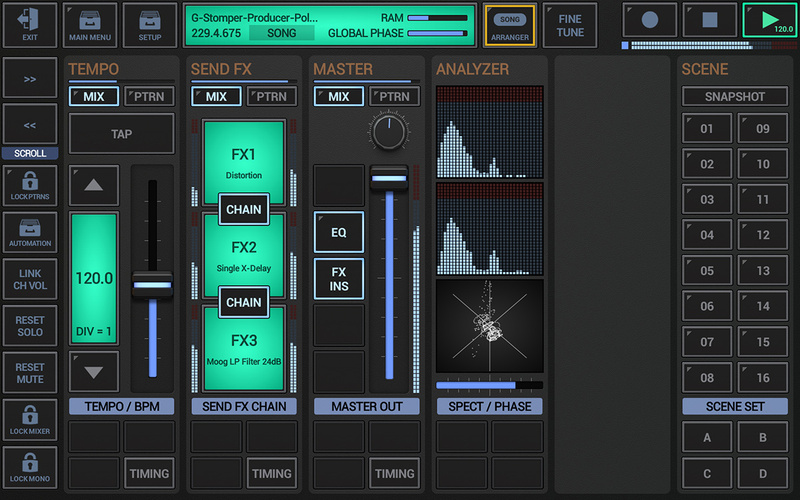 Monophonic Melodic Step Sequencer, max 24 Tracks. 24 Drum Pads for live playing. 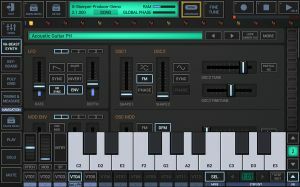 Polyphonic Virtual Analog Performance Synthesizer (Advanced FM support, Waveform and Multi-Sample based Synthesis). 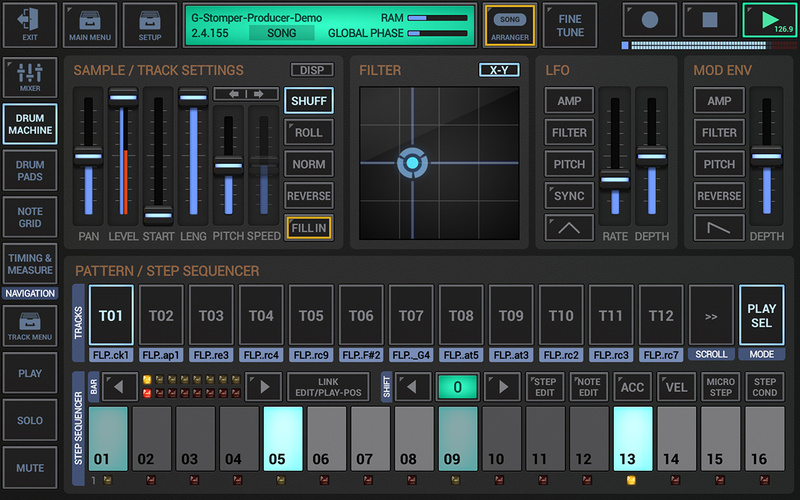 Polyphonic Step Sequencer, max 12 Tracks. 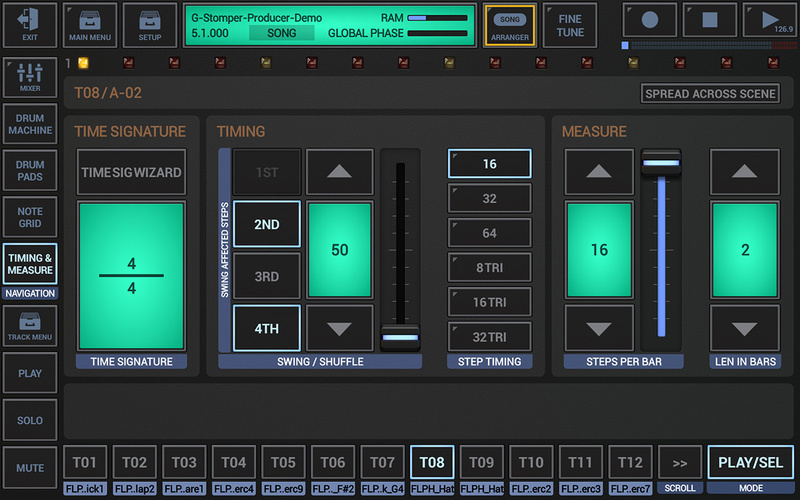 Line Mixer with up to 36 Channels (parametric 3-band Equalizer, Insert Effects, and Spectrum Analyzer per channel). Effect Rack with 3 chainable Effect Units. 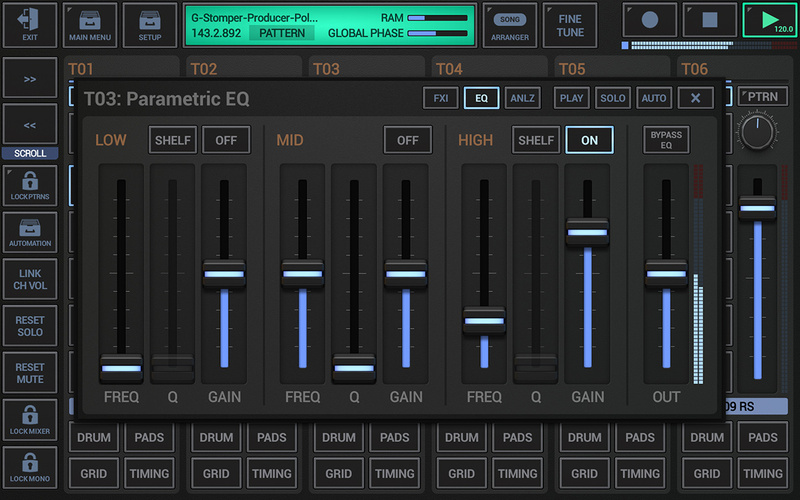 Master Section with Master Out, Parametric 3-band Equalizer, 2 Insert Effect Units. 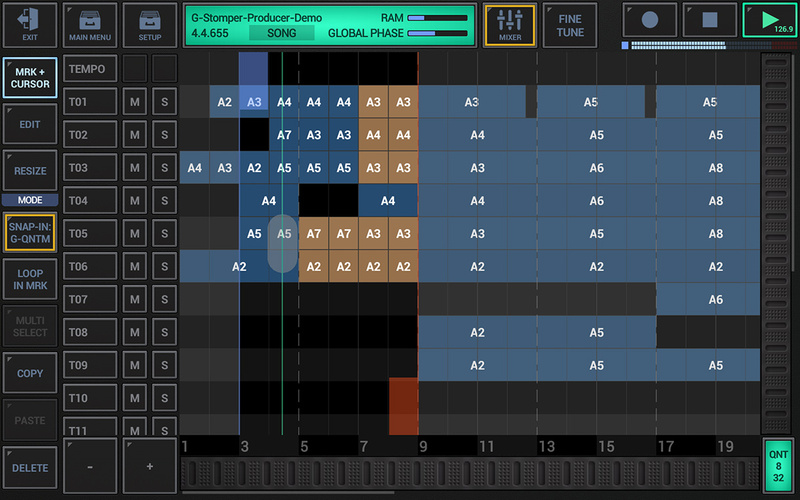 Dedicated Sequencer Track for Tempo Automation. Live Pattern Arranger with up to 64 Patterns per Track. 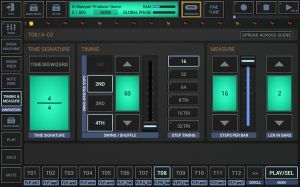 Live Scene Arranger with up to 64 Scenes. 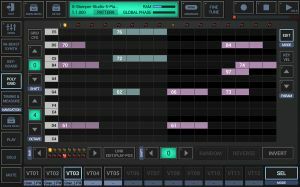 Graphical Multi Track Song Arranger with up to 39 Tracks. Individual Swing Quantization, Step Timing, and Pattern Size per Track. 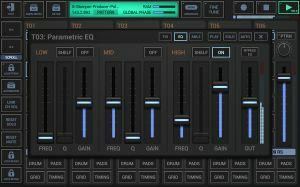 Up to 24 Drum Tracks, 12 VA-Beast Synthesizer Tracks, 1 Tempo-, 1 FX-, and 1 Master Track, each with individual Step Sequencer and Patterns with individual Timing & Measurement. Pattern Length: 1..128 steps / 8 bars. Step Timing: 16th, 32th, 64th, 8th triple, 16th triple, 32th triple. Steps Per Bar: 1..16 (for asynchronous beats). Shuffle/Swing (per Pattern): 50..75 (+ swing step selection). 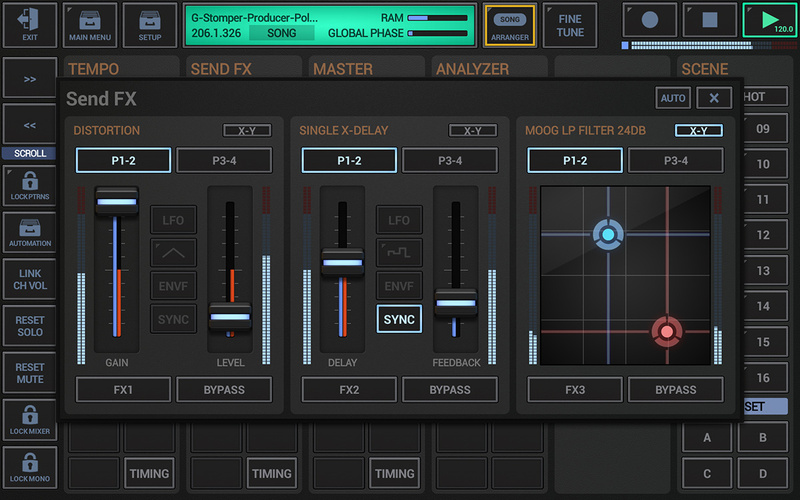 Up to 24 Tracks (the free demo is limited to 12). Micro Step tuning (1..31) between two regular Steps. Conditional Steps (for endless variations). Roll Function to simulate Step Timings up to 1/512. 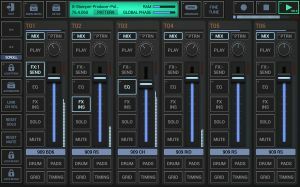 4 free assignable Mute Groups. 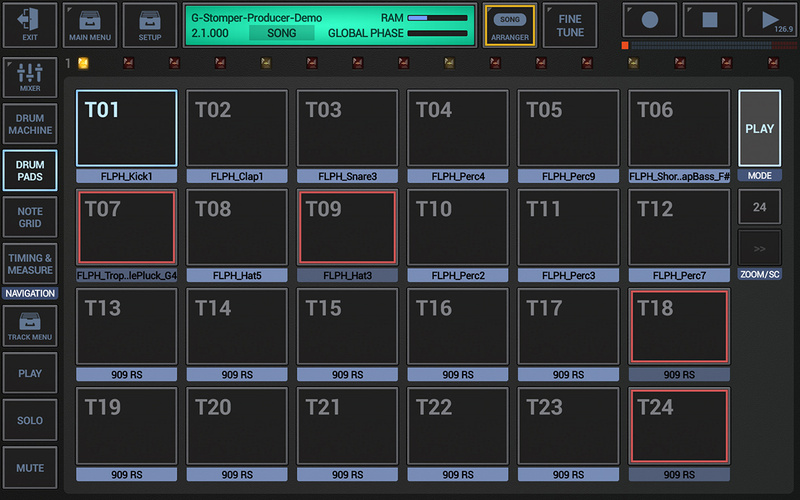 Dedicated Filter Section per Track (8 Filter types). Step Edit Mode (Edit your Sequence step by step). 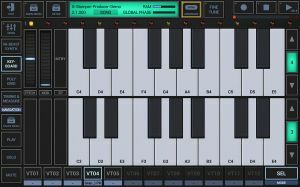 Note Edit Mode (8-Octave Piano Keyboard). Bounce single Sounds as new Audio files. Bounce complete Tracks as Loops. Accent Amount, Panorama, Volume, Start Point, Length, Pitch, Track Filter Type/Cutoff/Resonance, Envelope Type/Assign/Reverse, Sample Reverse, FX send. 2 oscillator assemblies, each with 6 regular waveforms: saw, pulse, triangle, sine, noise, dual sine (allows up to 4-Operator FM). 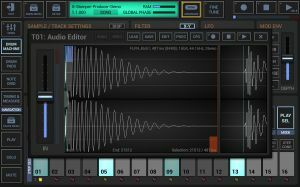 Using the dual sine waveforms you have a 4-Operator FM engine, which is almost unbeatable in its simplicity and flexibility. Full Multi-Sample support per oscillator (7th Waveform: PCM). 1 extra sync oscillator in each oscillator assembly (used to sync the single waveforms). 1 extra Noise oscillator (optionally on the oscillator mixer). 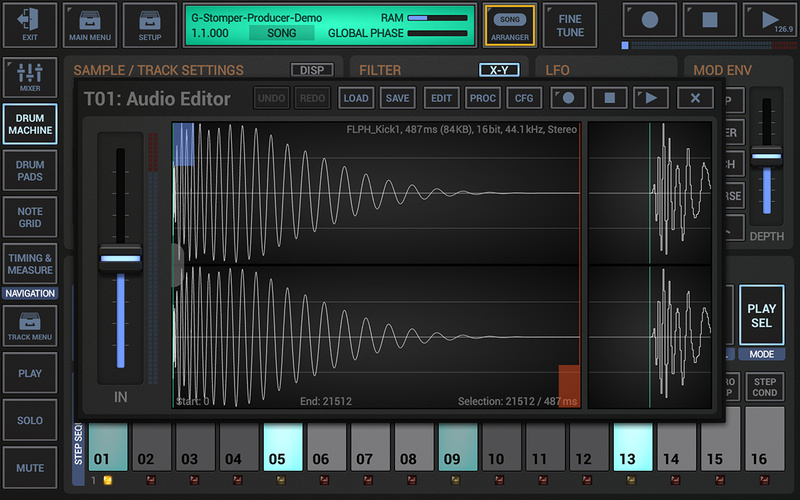 5 FM algorithms: PhaseFM (like in DX7), Log+, Log+/-, Lin+, Lin+/- . Powerful Oscillator Modulation Framework: FM, Differential FM, Filter Frequency/Resonance Modulation, Distortion, Distortion Ring Modulation (extra oscillator aboard), Ring Modulation. 3 Modulation LFOs / per voice (usable in cycling or envelope mode) which can be applied to 12 different parameters. 3 Modulation Envelopes / per voice (usable in Attack Decay, Attack Hold Release or repeating AD mode) which can be applied to 18 different parameters (incl. the LFO frequencies and amounts). 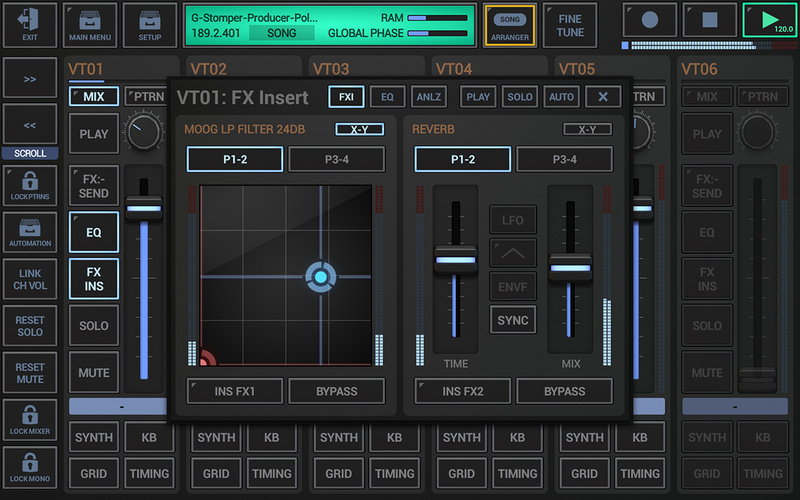 1 free assignable Morph Group (Modulation Wheel). 2 Filter Sections, each with 8 filter types, each optionally with Keyboard Tracking. 2 Dedicated ADSR Envelopes for the filter 1 & 2 frequency. 1 Dedicated ADSR Envelope for the Amplification. Global Vibrato to give your sounds the final touch. Stereo Unison (up to 5 layers). Arpeggiator with 4 different operation modes in up to 4 Octaves. 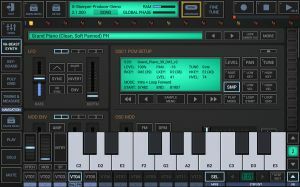 Polyphonic Glide: Morph between complete chords. 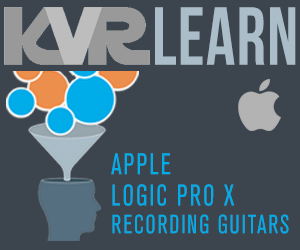 Polyphonic Legato: Morph between complete chords without re-triggering the envelopes. Chord Memory: Map complete chords to a single key. 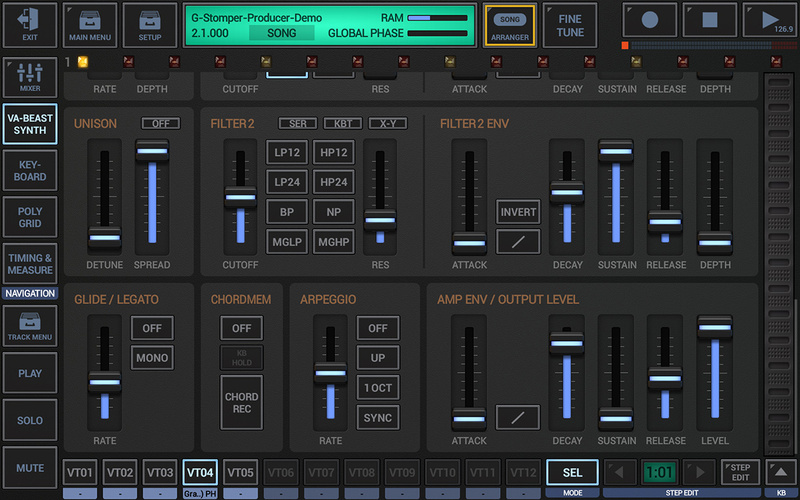 Up to 24 Drum Sampler Channels. 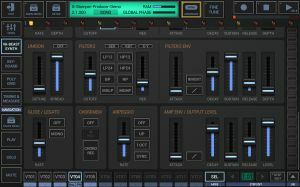 Up to 12 VA-Beast Synthesizer Channels. Solo, Mute and FX:send, and Preview (Play) for each Channel. 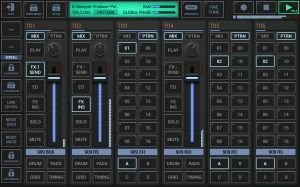 Parametric 3-band Equalizer per Channel + on Master Track. 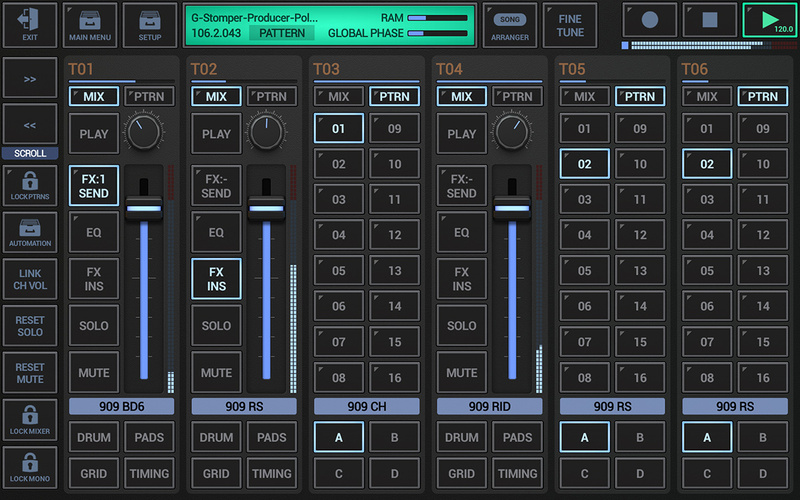 2 Insert Effect Units per Channel + on Master Track. 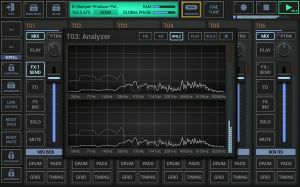 Spectrum Analyzer per Channel + on Master Track. 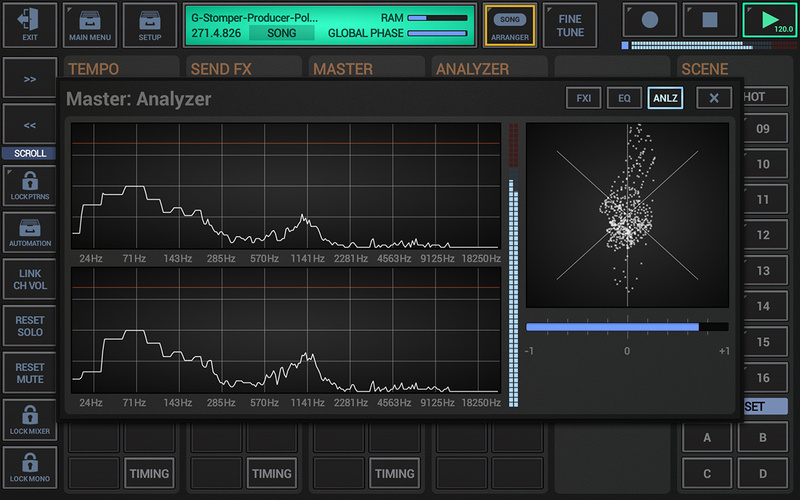 Phase Scope / Phase Correlation Meter on Master Track. 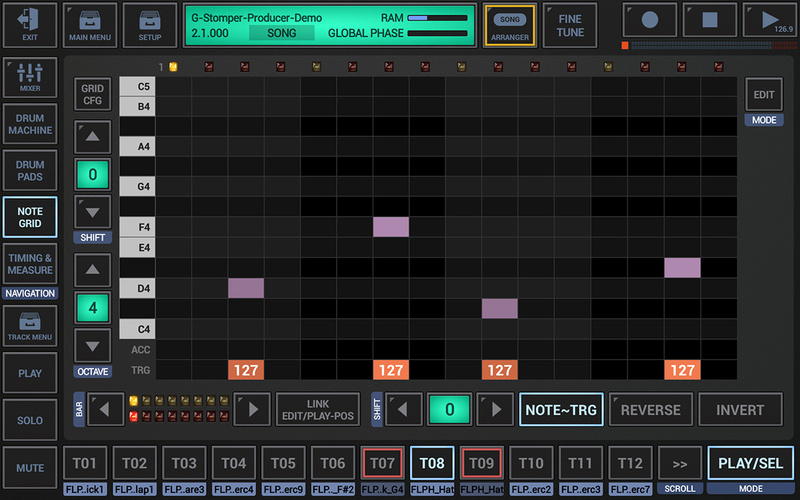 Live Pattern Arranger per Track. Up to 64 Patterns per Track. 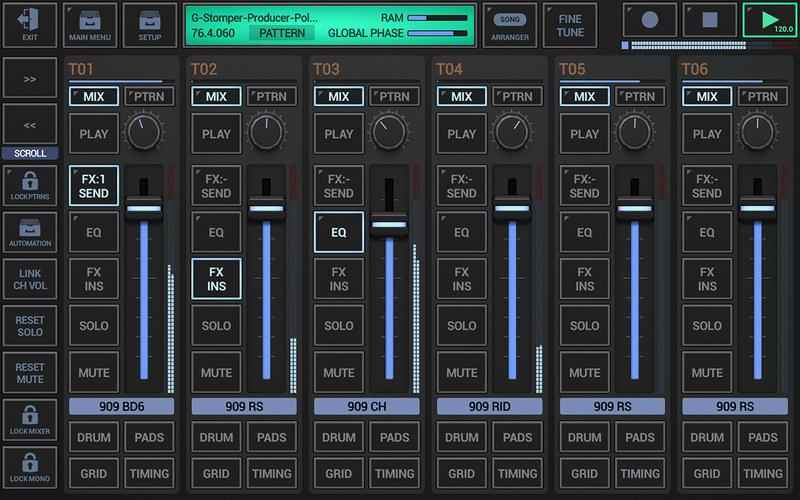 Up to 39 Tracks to arrange your songs. Insert single Patterns or complete Scenes. Select, Copy/Paste, Move, Resize Song events. 8 Filter types **, *ef, *sc. 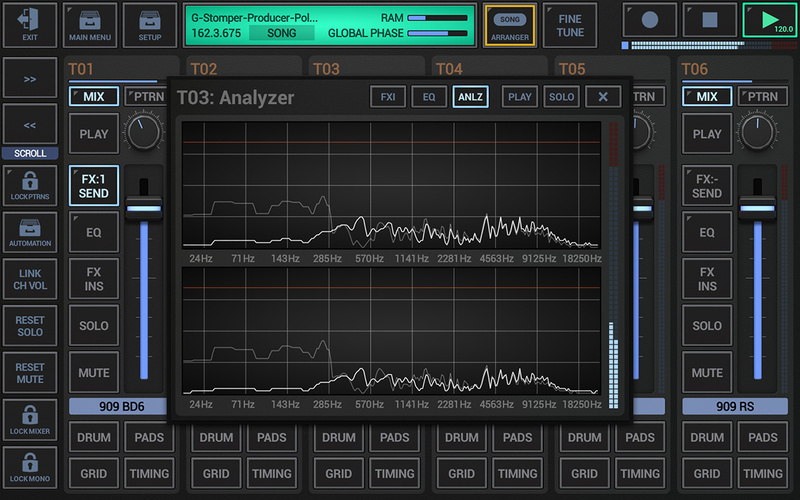 * Tempo sync, ** Tempo synchable LFO, *ef Envelope Follower, *sc Side Chain Support. Dual Piano Keyboard view with independent octaves. 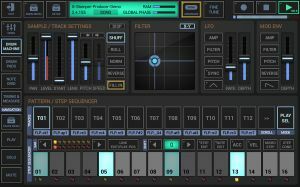 On-Screen Modulation wheel (free assignable morphing). 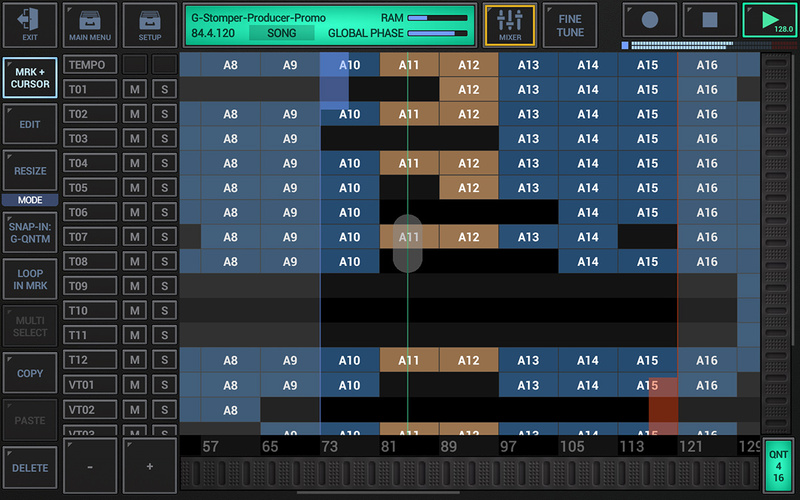 Play in sync with any Link-enabled app and/or Ableton Live over the same WiFi network. Android 6+: USB (host+peripheral) + Bluetooth (host). 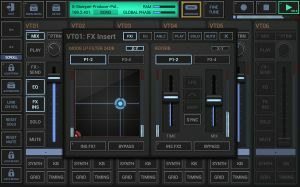 Support for Virtual MIDI Ports to address more than 16 channels. 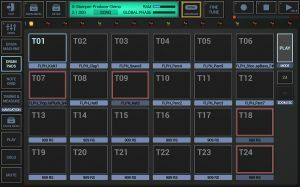 MIDI Export: Export Scenes as MIDI for later use in your favorite DAW or MIDI Sequencer. 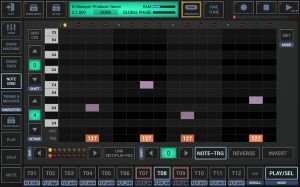 MIDI Import: Import MIDI files/songs as Project. Bit Rates: 8, 12, 16, 20, 24, 32, 32 float, 64 float. All Sample Rates (tested from 6kHz to 192kHz). 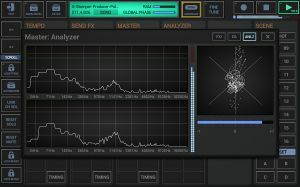 SFZ, based on Samples in wav and aiff format. 16-bit, 44.1kHz/48kHz (depending on the device), Stereo. (the Internal Sample Rate can be changed in the settings). (sum or Track by Track export).